The ARPANET made its first host-to-host connection on October 29, 1969 and from there slowly grew into a behemoth, laying the groundwork for our modern internet. The good folks over at Smithsonian magazine recently GIF’d the growth of the ARPANET from 1969 to 1977. But why stop there? Inspired by their wonderful GIFferings we made our own, showing not only the steady rise but the inevitable fall of this now-defunct network. It’s like a visualization of the pre-internet internet, if you will, from birth to death. The most striking shift you can see in the map comes in the mid-1980s. The MILNET was physically split off from the ARPANET in 1984 (though the administrative split happened in 1983), taking with it most unclassified military traffic. You can see a decline in nodes on the ARPANET after ‘84 when the MILNET was quarantined, save for a few pathways to the ARPANET for things like email. The ARPANET is almost gone by 1989, though the lights wouldn’t officially be turned off until July of 1990. 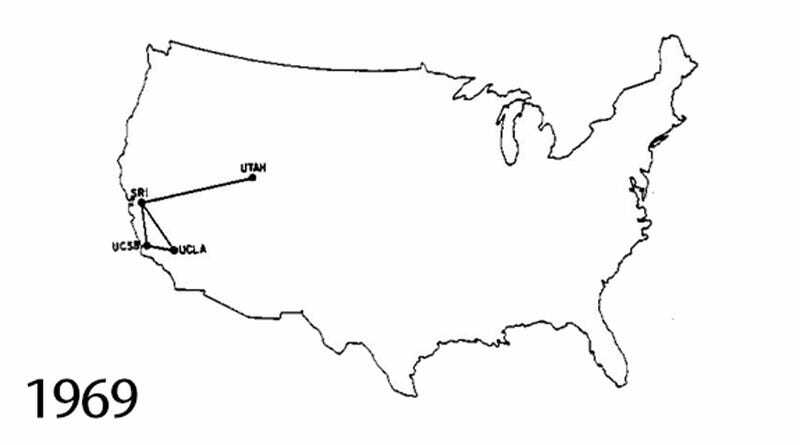 Frustratingly, I can’t for the life of me find a geographical map of the ARPANET for 1985. If you see one hiding somewhere please send it my way so that we can add it. RIP ARPANET.